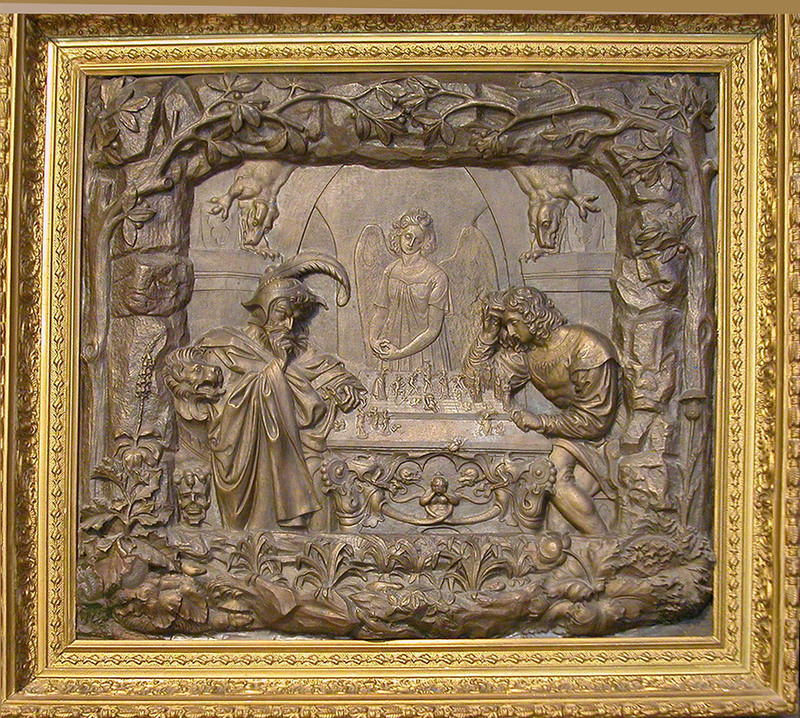 Bronze Bas Relief Masterpiece and Background Story - The King Has One More Move! Chess Art Known as "The Game of Life"
Our Great Great Grandfather Anthony W. Jones Sculpted this Chess Art Masterpiece in the Mid 1800's. Now Available--For The First Time In Over 150 Years. Framed Chess Art Bronze Bas Relief by the Sculptor Anthony W. Jones, New York Artist & mid 19th Century Contemporary of the German Painter Moritz Retzsch. The above chess art bronze bas relief shows the Faustian inspired figure of Mephistopheles playing what at first glance appears to be a winning game of chess for the soul of a young man before the gaze of a mournful angel. It has been in our family ever since and always known as "The Game of Life". Few people know anything about our great, great grandfather though examples of his art work are on display on the web site of the New York Historical Society Museum & Library. For extensive background information about Jones and his other works of art click here. Moritz Retzsch painted this well known work often known as "Checkmate" about the same time. Until we began research on the internet, we had no idea our great, great grandfather created in stunning bronze detail the scene depicted in the famous 19th century chess art oil painting by Frederich August Moritz Retzsch (1770-1857) titled “Die Schachspieler” (The Chess Players) sold by Christie's auction house in October of 1999. 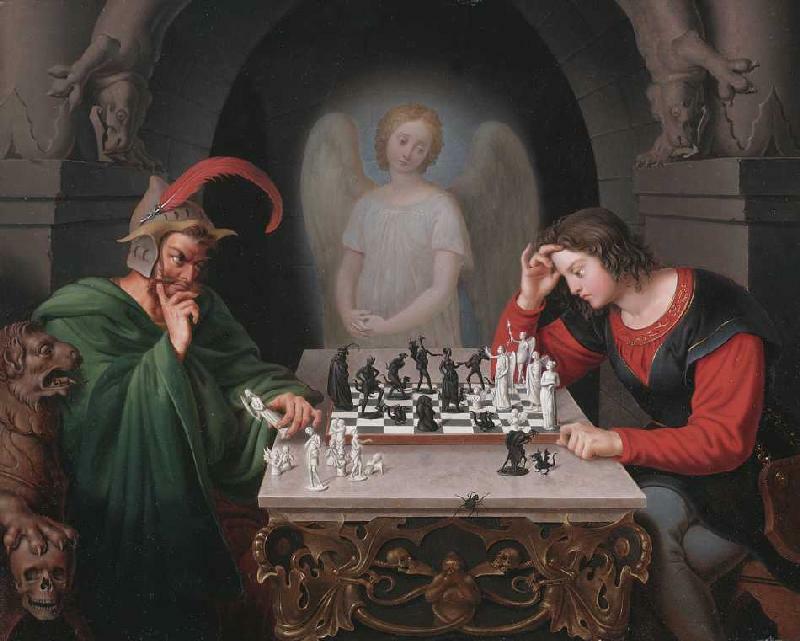 Retzsch's painting is often known today as "Checkmate". For more about Moritz Retzsch, his early work and fascination with the theme of Goethe’s Faust go here. The great chess master Paul Morphy sees the Moritz Retzsch "Checkmate" painting: the "One More Move" story! Our on-line research discovered many video and print references to modern day sermons that tell the story of how the young man in the Retzsch chess art painting (often referred to as “The King”) had “one more move” to win the game! One of those recent sermon references to the Retzsch painting was delivered by the Reverend Billy Graham before the Empire Club of Canada to begin its 1955-56 season. To read that entire sermon click here. For more information on similar modern day references to this work click here. For an introduction to the spiritual and religious symbolism in both the Retzsch painting and the Jones bas relief click here. The one more move story goes like this: a famous chess player sees the Retzsch "Checkmate" painting somewhere in a museum. He examines the chess piece positions in the painting and discovers the young man’s chess position was not quite as hopeless as one might first imagine. We discovered the story was “basically” true! The chess master was Paul Morphy. To learn more about Paul Morphy click here. To learn the details of the story and the facts and circumstances of chess master Paul Morphy’s “encounter” with the Retzsch painting in the fall of 1861 click here. The purpose of this web site is more than just an effort to honor and pay tribute to our great, great grandfather. We are almost 70 years old. This is a limited opportunity for anyone who finds inspiration in the “background story” and rich imagery of this masterpiece to acquire an exact replica before we pass into the great unknown. If the original Jones bas relief is eventually donated to a museum there is no guarantee it will ever be put on public display. We are painfully aware that much beautiful art work privately donated to museums often ends up in “storage” for want of public display space. For the first time in 150 years because of advances in modern mold materials and resin technology it is now possible to accurately and affordably duplicate all of the exquisite details of this bas relief chess art masterpiece down to the very fine lines inscribed on the angel's wings. For information on the bronze resin process that makes affordable duplication possible see our FAQ's page. If you should prefer to acquire a copy in original bronze, that is certainly possible. The timeless message of the Retzsch painting and the bronze bas relief for this "game" called "life" is never, ever give up. Always persevere. No matter how overwhelming life’s obstacles may at first seem. There is always a solution--another “move” that leads to a successful outcome for all of life’s many challenges whether they may be spiritual or temporal. Chess was chosen as the perfect setting for that “Game of Life” lesson in the confrontation and struggle between man's worst vices and his highest and most noble virtues. The Jones bas relief sculpture, the symbolism of the chess pieces and the story of the successful conclusion of the game by the chess master Paul Morphy combine to serve as a beautiful and constant reminder of the inevitability of success if one is willing to persist and persevere. The optimism of that message is applicable to everyone in every walk of life. We hope the information gathered here is helpful for understanding and appreciating both the imagery and impact of the scene depicted in this work of art on 19th century audiences and the inspiration it continues to offer today.